The Icelandic Meteorological Office announced Saturday May 21 at 2:00 pm CDT the eruption of the volcano Grímsvötn in Iceland (N64,24, W0172) following a short period of tremor. This is Iceland’s largest volcano. The eruption started under ice but spewed a plume up to 65,000 feet. Grímsvötn is a well monitored volcano. It last erupted in October 2004 and lasted about a week. 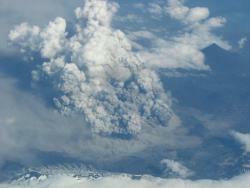 This eruption was larger than last year’s Eyjafjallajokull eruption, but will likely have less impact on air traffic. While Keflavik, the Iceland’s larges airport, was shut down, the ash plume from Grímsvötn is currently drifting east and north away from Europe. Volcanic Ash Advisory Centers are set up across the globe to monitor volcanic ash and issue warnings as appropriate. These centers make use of satellite observations to monitor the eruptions and the movement of the ash cloud. Below is a link to a satellite animation of the eruption. This is a European satellite and the time between images is about 15 minutes. "On May 18th, 1980, thirty years ago today, at 8:32 a.m., the ground shook beneath Mount St. Helens in Washington state as a magnitude 5.1 earthquake struck, setting off one of the largest landslides in recorded history - the entire north slope of the volcano slid away. As the land moved, it exposed the superheated core of the volcano setting off gigantic explosions and eruptions of steam, ash and rock debris. The blast was heard hundreds of miles away, the pressure wave flattened entire forests, the heat melted glaciers and set off destructive mudflows, and 57 people lost their lives. The erupting ash column shot up 80,000 feet into the atmosphere for over 10 hours, depositing ash across Eastern Washington and 10 other states." And for everyone, here are some fabulous Boston.com photos to commemorate the event. Geology-paloza: what's wrong with the world these days? Tracking worldwide earthquakes: Here is a map showing the epicenters of worldwide earthquakes over a 35-year span. No wonder it seems like earthquakes are happening all over the globe.Courtesy WikipediaGeology may not be the "sexiest" of sciences, but when it gets cranked up, it can really make its presence known. And we've had a very interesting run of geological news in the past few months. The recent focus on earthquake matters is really summed up well in this commentary piece by Craig Childs of the Los Angeles Times. • With population increasing across the globe, more people are living in more hazardous regions. • With our explosion of communications, we're hearing about earthquakes more often and in more depth. 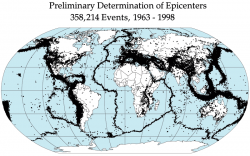 • Since records have been kept on seismic activity, we know that about 50 earthquakes are recorded every day. Annually, the Earth averages 17 major earthquakes (7.0 to 7.9 on the Richter scale) and one doozy (8.0 or higher). The activity we've been seeing this year fits into those numbers so far. As of Friday midday, the death toll in the China earthquake had climbed to over 1,100. While the devastation is much like the quakes in Haiti and Chile, the quake's cause, we're learning, was different. Not all earthquakes start the same way. While most at the result of interactions between Earth's tectonic plates, this week's earthquake in China was different. It was an "intraplate" quake contained within an individual tectonic plate. Here's a full explanation. Basically, a quake occurs along a smaller fault that forms inside the plate, which is caused by other plates pushing on that plate's edges. The New Madrid Seismic Zone in the central U.S., stretching from Arkansas to southern Illinois, is another example where "intraplate" earthquakes occur. On average, there's about an earthquake every-other-day in that zone, but they're very mild. But a large quake in the zone can spread damage over a much larger area. 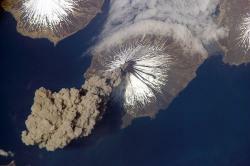 Iceland's Eyjafjallajokull volcano continues to erupt and its ash continues to interrupt airline travel. Geologists have no idea how long the eruption might last. Back in 1821, the volcano erupted for several months. And the larger neighboring volcano, Katla, has not erupted yet. Typically it follows after Eyjafjallajokull's initial eruptions, and geologists say if that happens again, Katla could send out even greater amounts of volcanic ash. Iceland may be the Rodney Dangerfield of Europe – it just doesn't get no respect – but geologically it's at the epicenter of world attention these days. Iceland is in a volcano hot zone and an eruption Sunday of the volcano Eyjafjallajokull has garnered a lot of attention. Historically, every time Eyjafjallajokull erupts, the larger volcano Katla erupts soon after. Below is aerial video shot by the Iceland Coast Guard showing Sunday's eruption. Stay tuned to see if there are more eruptions to come. Past eruptions of Katla, with lava and gases passing through Iceland's ice sheets, have created toxic smog that have damaged crops and sickened people in the British Isles. Here's the full AP report. 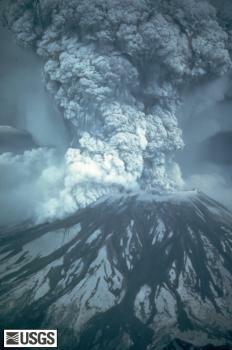 Scientific American has put together an interesting slide show of images from the Mount Redoubt eruption. The volcano has moved to a more steady, but less explosive, eruption pattern. And there are web cams of the volcano available here and here. Mt. 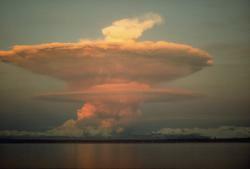 Redoubt's eruption in 1990: A dramatic, mushroom-shaped eruption column rises above Mt. Redoubt on April 21, 1990. Clouds of this shape, which are produced when the upper part of an eruption column attains neutral buoyancy and is spread out above the troposphere-stratosphere boundary, are common during powerful explosive eruptions.Courtesy USGSAlso be sure to check out the Alaska Volcano Observatory's page on Mt. Redoubt's activity. A little something called "volcano monitoring"
Last night, Louisiana Governor Bobby Jindal criticized government spending authorized by the stimulus bill, calling particular attention to "something called volcano monitoring." Hey, $140 million is a lot of money, and what does it get us? Turns out volcano monitoring is actually kind of a big deal. It teaches us a lot about earth processes, of course, but some folks aren't swayed by talk of scientific advancement. An argument for everyone is that monitoring enables authorities to plan and implement evacuations when necessary. "The USGS has issued several warnings over the past 10 years, though predicting the timing and size of eruptions remains a difficult task. Volcano monitoring likely saved many lives — and significant money — in the case of the 1991 eruption of Mount Pinatubo in the Philippines (where the United States had military bases at the time), according to the USGS. The cataclysmic eruption lasted more than 10 hours and sent a cloud of ash as high as 22 miles into the air that grew to more than 300 miles across. The USGS spent less than $1.5 million monitoring the volcano and was able to warn of the impending eruption, which allowed authorities to evacuate residents, as well as aircraft and other equipment from U.S. bases there. The USGS estimates that the efforts saved thousands of lives and prevented property losses of at least $250 million (considered a conservative figure)." Still not convinced? Here's another benefit: volcano monitoring keeps our air routes safer, too. See, a pilot can't easily tell the difference between an ash cloud and a regular cloud. But ash clouds can damage flight control systems and kill jet engines. Don't think that's really a big problem? Some 10,000 passengers and millions of dollars' worth of cargo are ferried by US aircraft over the North Pacific every day, and there are 100 potentially dangerous volcanoes under those air routes. Columbia's Nevado del Huila regionCourtesy USGS/R.L. SchusterThe eruption of a volcano in southern Columbia has claimed the lives of at least 10 people and officials fear the death toll will rise. Nevado del Huila is the highest volcano in Columbia, towering at 17,602 feet. Early last year It came to life after being dormant for more than 500 years. The volcano is located in a remote area of southeastern Columbia about 150 miles south of Bogota. A number of isolated villages surround the mountain, and thousands were evacuated earlier this week for fear of an impending eruption. When the eruption finally happened yesterday, it triggered two large landslides along the Paez River. Seven people are still listed as missing and the region remains on high-alert. But the locals have good reason to be nervous. 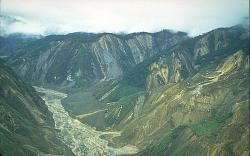 In 1994 several hundred people were killed by landslides from Nevado del Huila induced earthquakes. And nine years before that a nearby volcano named Nevado del Ruiz erupted and killed more than 25,000 people. Three volcanoes in South America have become quite active. Here's a video report from National Geographic. One volcano in Ecuador is so active that it suspended flights into Quito's airport for a while. 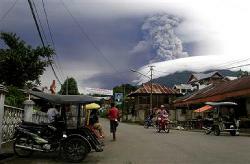 The alert status for Mount Soputan in Indonesia has been raised to the third highest level on their four-level system after beginning a minor eruption on Monday. The region around the volcano is relatively uninhabited, with the closest villages at least 5 miles away. Still, residents were warned to stay a safe distance from the volcano. The Soputan stratovolcano is one of Indonesia's most active volcanoes.